Where it all Started & Where it all still happens! 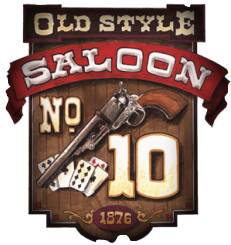 Bold Murder during broad daylight in a boomer’s saloon on a near hopeless gold claim- all keys in the pages of Deadwood’s loud and lusty past evolved into the now world famous Saloon #10. Where Wild Bill Hickok met his demise and the sawdust still covers the floor. For more than a century, the Legendary Old Style Saloon No. 10 has defined the historic town of Deadwood. Thousands of artifacts and antiques grace the walls and ceiling. The faces of history live in hundreds of historical photographs of Deadwood’s most famous and infamous characters. It remains the “go to” experience for locals and visitors alike to step back into Deadwood's colorful past. Entertainment: Complimenting all this living museum has to offer, don’t miss the historical re-enactments, live nightly music, unique signature shopping, live action gambling, and South Dakota's largest whiskey selection, offering over 171 Bourbons, Scotchs & whiskeys. Truly deserving of its new branding American Whiskey Bar. Dining: Upstairs is home to the Deadwood social club and top of the ten wine and martini bar. An Italian Steakhouse well known for a menu packed full of flavor and an atmosphere that is bursting with the sound of friends and family gathering for some social fun and great food. End your evening out on the roof top patio sitting around a roaring fire and sipping on your favorite cocktail. So join us, Kick back and relax and take it all in. Legend refers to the No. Ten as “the only museum in the world with a bar” but this is your chance to discover, it’s where it all started and where it all still happens.